This entry was posted in card making, Creations From My Craft Room, Creativity and tagged chair, Etsy, old, Photograph, Shabby chic by thecontentedcrafter. Bookmark the permalink. 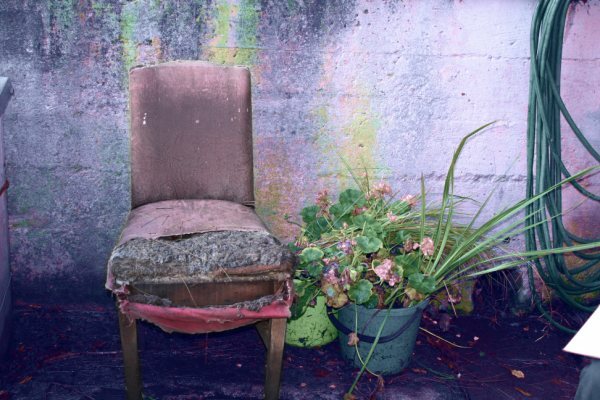 I agree with Born to Organize (Alys) that there is something about old chairs in particular that is interesting….but don’t ask me what it is! lol All of our chairs, since we downsized 7 years ago, are unique, old and full of memories. Each of them has a story…and each should have such a lovely tribute as this one. Bravo! Your store is such a great idea. Thanks Linne! 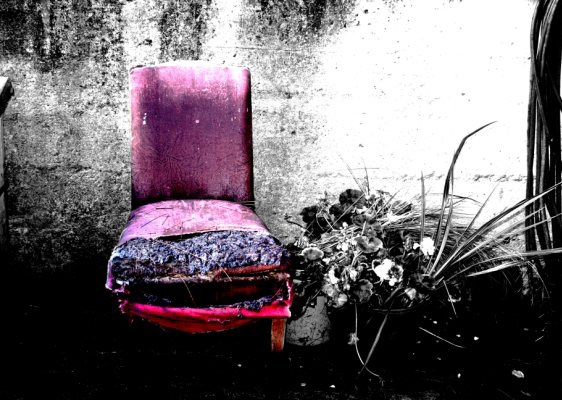 I know – I didn’t mention in my story that part of what prompted me to get the photo taken was that i was watching this chair disintegrate faster and faster – it was out in all weathers and had been for some time… about 6 weeks later it finally and fatally collapsed under the weight of a young man who sat down too quickly ……….. So this is really an ‘In Memorium’ photo. Love that story, felt like I was part of the garden crew 😀 Sounds like a cool job. I can’t tell you how many times I’ve pondered the same thing over some toss away on the curb. As you know I quite fancy old beat up old stuff. I like to wonder about who owned them and their existence in their shiny past. 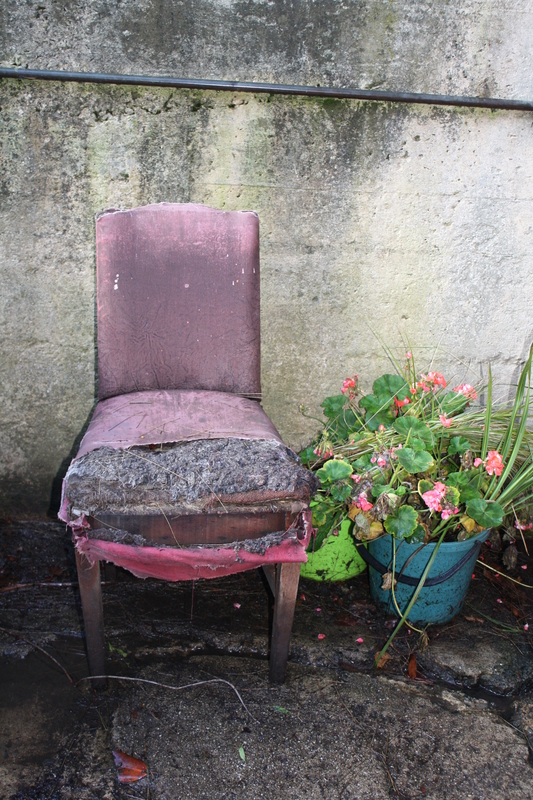 This forlorn old chair probably has a few stories to tell and of course you’ve made it a star in it’s ‘golden’ years. Glad you were able to capture the moment, I like what you did in Photoshop. I’ve taken a class too, but it’s something you really have to work at to know well. I had visions of making fabulous digital Scrapbook pages and did a few, but I need to update my version to use many of the digital kit’s I downloaded. We are remembering the fallen who’ve fought for our freedoms today, do you have a veterans day? Thanks again Boomdee for your wonderful comments and encouragement. Re Photoshop – I decided a while back that it’s because I’m so tactile and need to feel something in my hands that I don’t relate that much to the camera and related doings – give me a pencil, a crayon, a paintbrush and I’m off…. give me a needle and thread or a ball of wool and needles of the knitting or crochet type and I’m happy…. give me a lens and a button – just doesn’t work the same for me! Strange huh? We have ANZAC day here, which is the Australian and New Zealand Army Corps – the name by which our soldiers were known in the first and second wars. It falls on April 25th. Like all ‘Memorial’ days it has dawn parades, remembrance services and the odd gathering giving thanks to those who sacrificed their lives so we might all live in ‘freedon’. While I am pleased that in my life time I have seen the shift from glorifying war to a more honest stance on the horrors of it, I think the day should be marked with peace marches and demands to world leaders to give up supporting the companies that earn their trillions by supplying arms to either and both sides – then I would take part. Bravo Pauline, not a soap box at all but very good points. Since my hubbies dad served in the Canadian Forces, we do like to attend the salute at the Legislative grounds (weather permitted) to honour his memory. We think about him and the many who did not make it home to their families and not the raging wars by world leaders that are making some corporations billions. It’s a cup half full thing. We certainly can’t change the past, and it’s unlikely those corporations will ever be morally accountable for their profits, but hopefully young people participating in these events will affect the future in a positive way. You make a good point Boomdee. It was not my intention to dismiss those who fought, who suffered, who lived and died, they do indeed deserve all honour. And free medical expenses for the rest of their lives – but that’s another soap box…. No doubt, there are so many mis-managed veteran affairs in Canada, I could just spit. Unthinkable Government cut backs and unappreciative treatment of those returning from duty even today. All we can do is make it known to our local government representatives that they ARE NOT doing a job Canadians are proud of by NOT re-electing those who disappoint. Like you say, another soapbox for another day. Thanks Wendy – it is isn’t it! There is something about chairs that beg refinishing or refurbishing. I can see this one is tired, but clearly shined in it’s day. Now it’s to become a card in your shop. The stories continue. Indeed, there is hope for all of us. You, my dear, are a breath of fresh air. That is a fantastic photo, you framed it wonderfully.